Too up the salted caramel even more I made a smooth rich salted caramel buttercream and drizzled even more caramel over the top! Indulgent enough for you? 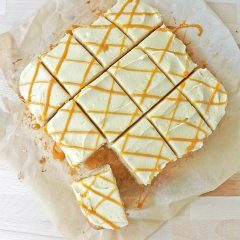 The base of this cake is not too far away from your basic banana cake, all that is different is I replaced most of the sugar with maple syrup. Usually I would add around 200 grams (1 cup) of sugar but this time I used 160 millilitres (2/3 cup) of maple syrup and only 65 grams (1/3 cup) sugar instead and reduced the temperature of the oven by 25 degrees as maple syrup has a lower boiling point them sugar. 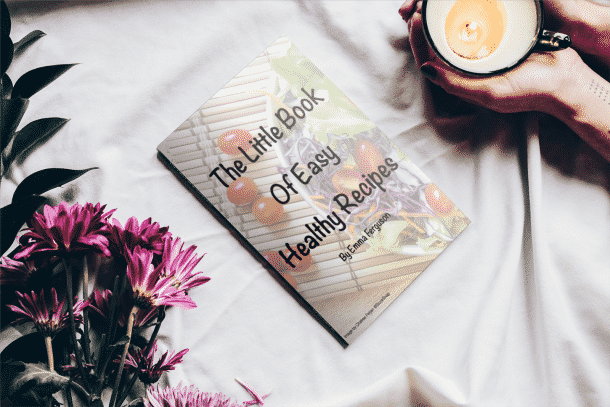 I wanted to keep its flavour not just use it as a sweetener. 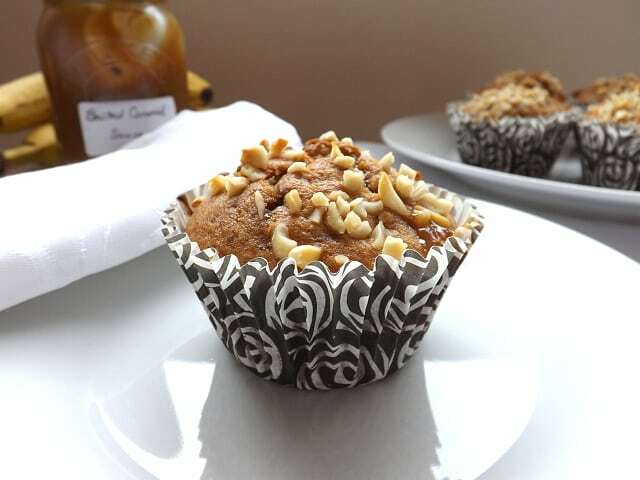 Also to help sweeten it up I added 3 small very ripe bananas, normally I would use large bananas as I am nuts for banana flavour, don’t believe me check out here, here, here and here! But I was conscious of how much liquid was being added to this batter, I wanted it to bake moist but still be fully baked all the way. And I still had the salted caramel swirl to think about. Like most of you I am addicted to this stuff the salty sweet combination is totally out of this world I use homemade but shop bought is really good these days. 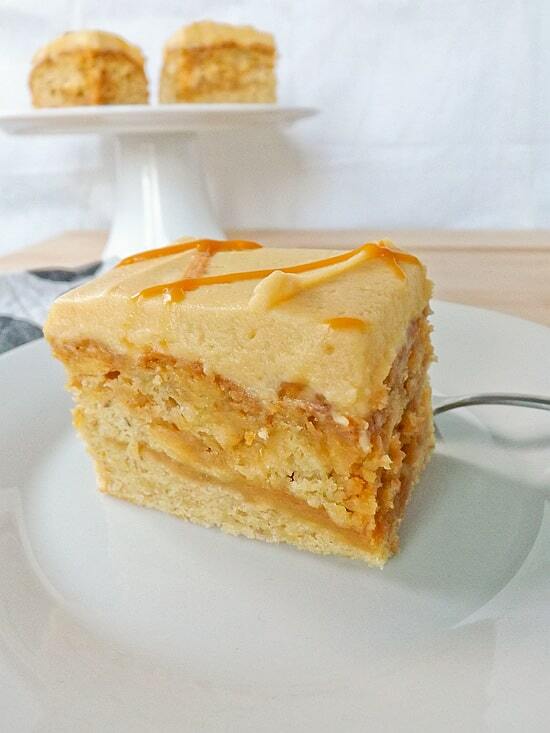 Originally I wasn’t going to put any frosting on this cake so I wanted my caramel in the cake. 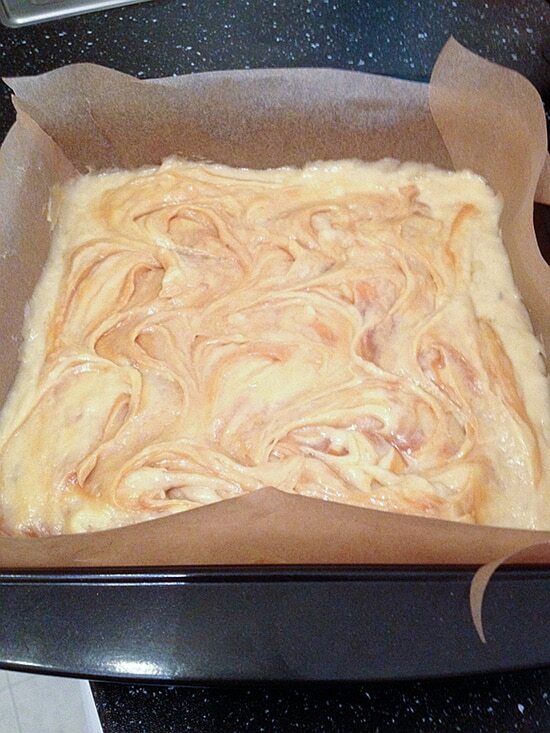 I took 5 very generous tablespoons and added it to the tin once the batter was just about to go in the oven. Then swirled it all about. 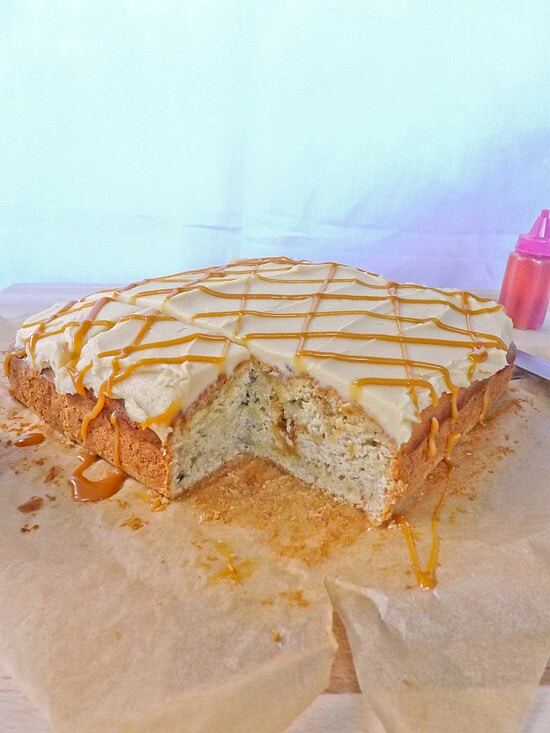 This gave it lovely ribbons of caramel running through the cake. Now I could have left it there, the first time I did and the cake was a lovely moist rich cake with all three flavours running through it. But the second time I made it I still had a little caramel left and used it up making a frosting for this cake and it va va voomed the cake out of this stratosphere! 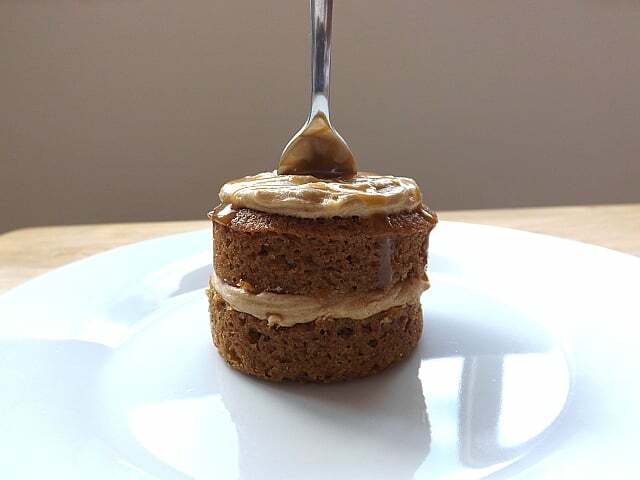 The frosting was made with a little fresh cream to give it a lovely smooth richness and 3 more tablespoons of caramel were added. Talk about calorie laden!!! 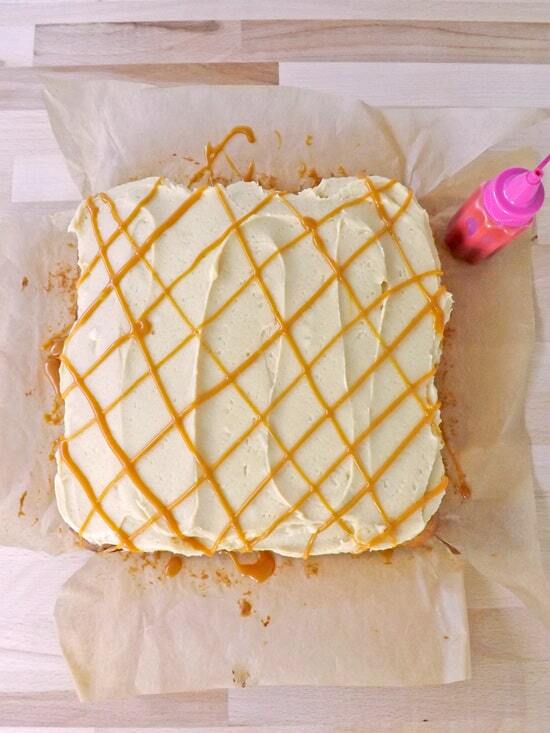 This cake is lovely with or without the frosting. 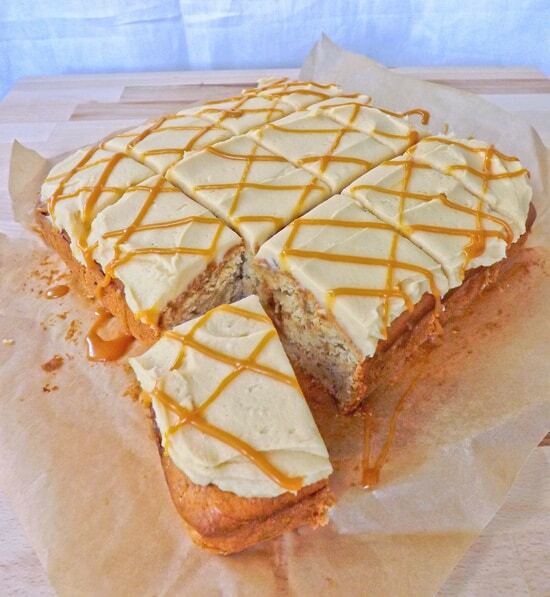 It’s a moist banana sponge with a subtle hint of maple syrup and ribbons of caramel running through the cake batter. The frosting just tops it off nicely to be a little more indulgent, either way this is a beautiful cake. 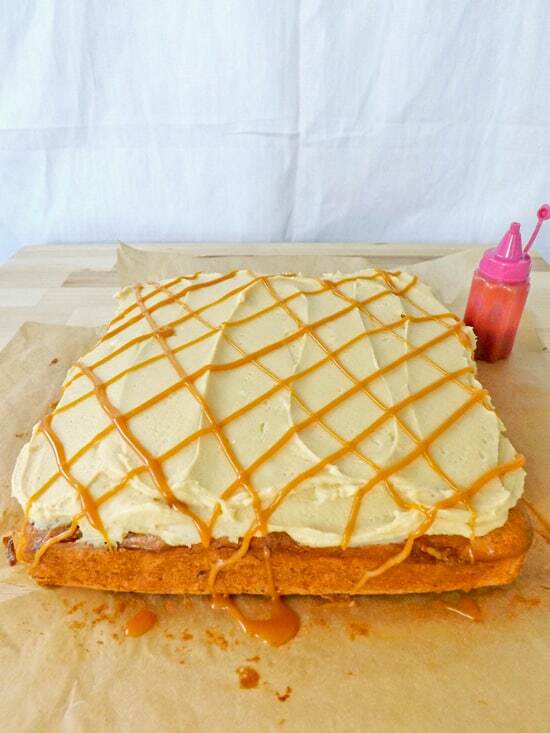 A lovely moist banana cake delicately flavoured with maple syrup and salted caramel all topped with a salted caramel frosting. 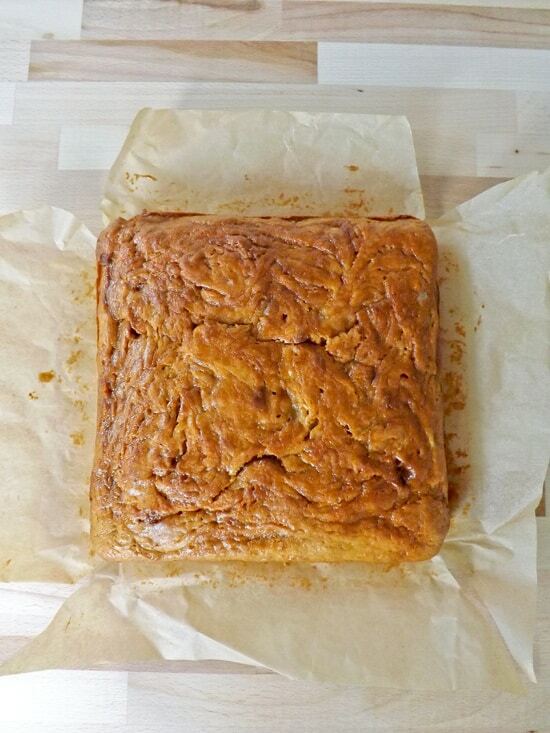 Preheat your oven to 180c / 350F / Gas mark 4 and line an 8 x 8 inch tin with parchment paper. Cream the butter and sugar together in a medium sized bowl until it is light in colour with an electric or stand mixer. Pour in the maple syrup and mix until well combined. This will take a few minutes to come together but it will. Add the eggs one at a time beating the mixture in-between each addition. Continue mixing until the mixture is smooth. 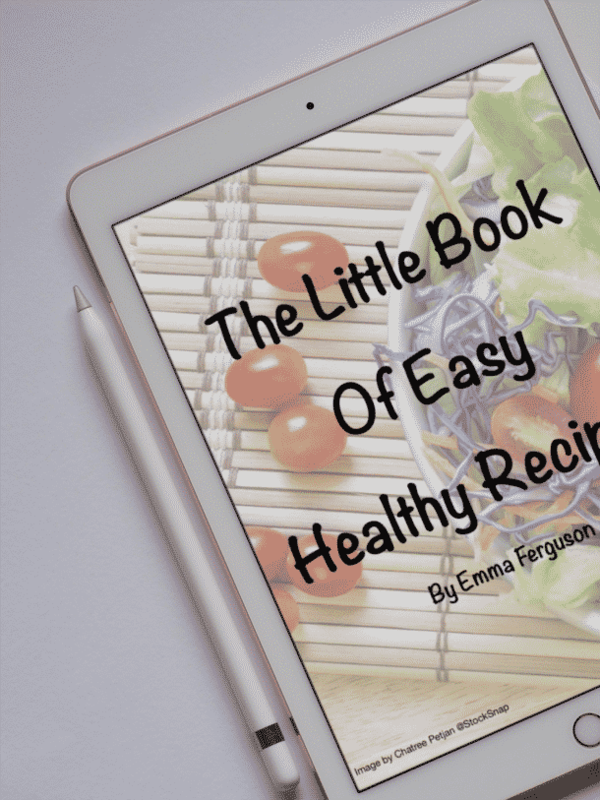 Gradually add the flour and baking powder and gently mix until fully combined. Fold in the mashed bananas carefully. 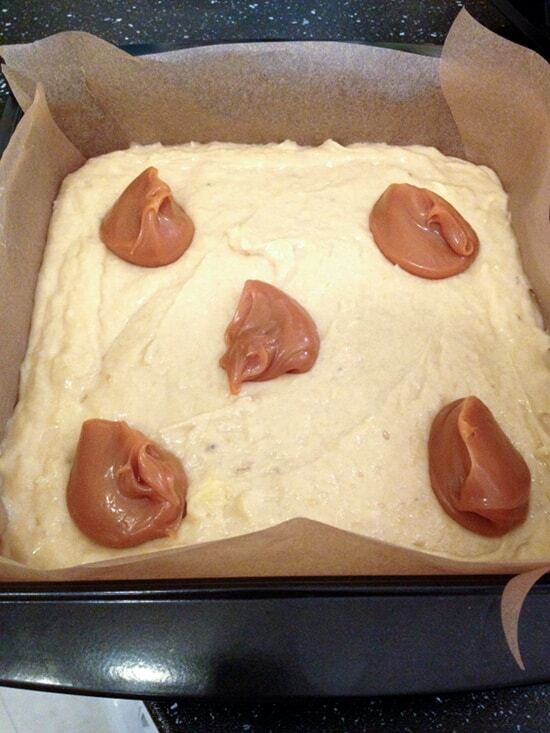 Pour the cake batter into the prepared cake tin. 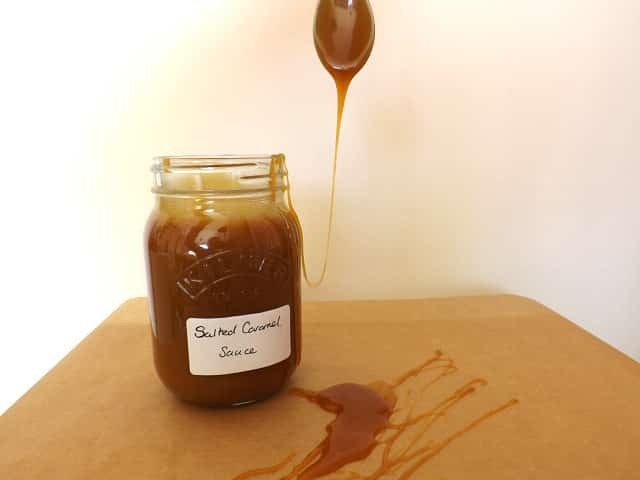 Place a spoonful of your caramel sauce in each of the corners and one in the middle and using a round edged knife swirl the caramel all through your cake batter. Bake for 40 to 45 minutes in the centre of the oven. Before taking out check to see if a skewer comes out clean first. If it does leave in the tin for 10 minutes, then turn out onto a wire rack to fully cool down. Beat your butter until it is light and fluffy. Add the icing sugar and mix it in. It may seem a little dry at this stage but thats fine. 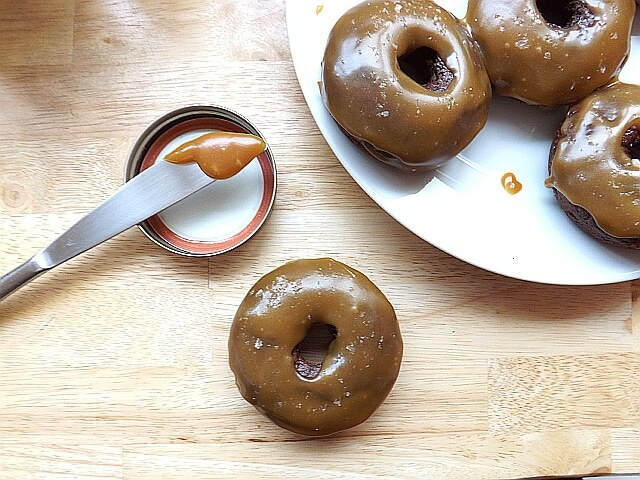 Add the cream and the salted caramel sauce and mix until everything is fully combined and smooth. 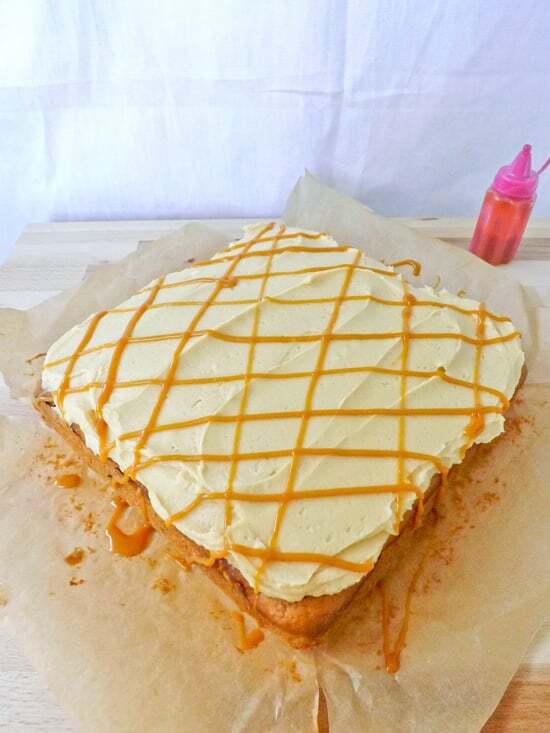 Once your cake is fully cooled down spread the buttercream over the top of your cake and if you are feeling very decedent add another caramel drizzle over the top of the buttercream. 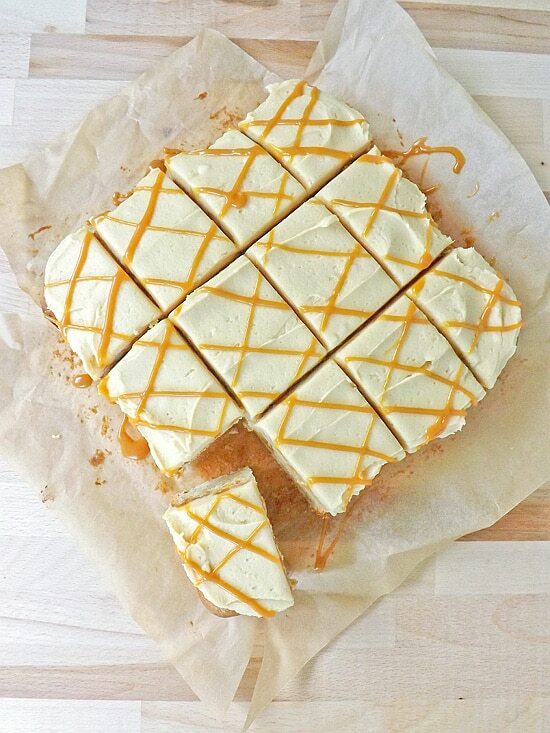 Cut into 12 squares and serve. This cake will keep in an airtight tin in a cool place for 3 to 4 days. I am sold! I adore anything banana! I also love caramel! What a combination. Your looks like it turned out absolutely perfect! Hi Kloe, thank you so much 😀 I also adore everything banana and am always looking for new ways to use it! Wow! That looks absolutely amazing. Yes, I’ll have some! Hi Brianna, thank you but you were right it was a dangerous cake to have around the house I kept going back for more all the time!!! Definitely over the top and fabulous!! 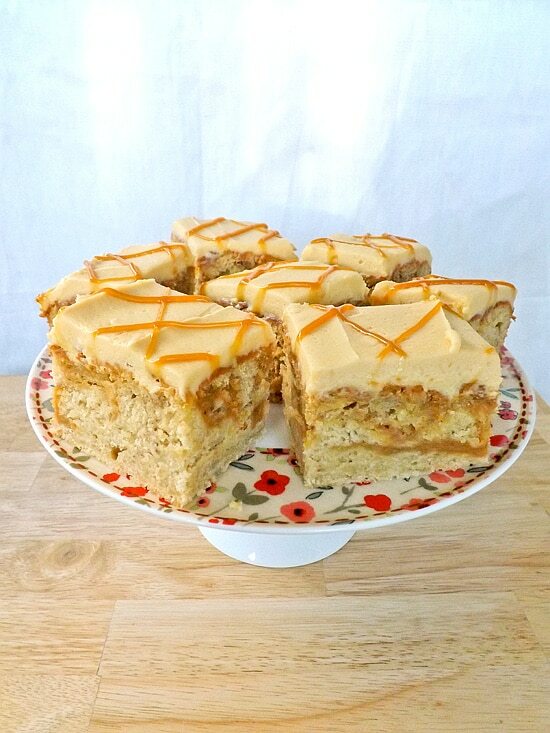 Hi Maureen sometimes you just have to go all OTT 😀 especially when there is banana and caramel involved! 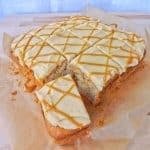 Hi Kelly, thank you so much I adore banana cake and am always experimenting with it. This one was definitely a winner 😀 Hope you had a good weekend!